Opportunity mapping is a research tool used to understand the dynamics of “opportunity” within metropolitan areas. The purpose of opportunity mapping is to illustrate where opportunity rich communities exist (and assess who has access to these communities) and to understand what needs to be remedied in opportunity poor communities. With support from the Ford Foundation and with assistance from the Greater New Orleans Community Data Center, the Kirwan Institute for the Study of Race and Ethnicity is applying its expertise in opportunity mapping in the New Orleans region. The following report provides some early results from this analysis and describes the next steps in the development (and expansion) of this project. 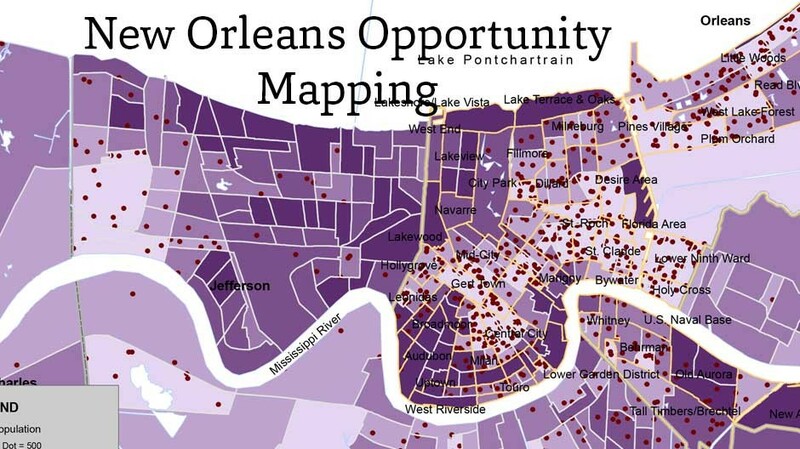 The application of opportunity mapping in the New Orleans region can provide a crucial source of neighborhood level information to aide the monumental redevelopment efforts in post-Katrina New Orleans. Opportunity mapping can assist in connecting marginalized or displaced residents of the region to opportunity rich areas, and assist advocates in assuring new housing opportunities are provided in opportunity rich areas. Opportunity mapping also provides information to aid the reconstruction/rehabilitation of areas most severely impacted by Hurricane Katrina, identifying what opportunities were missing in these neighborhoods prior to Hurricane Katrina (e.g. employment opportunities or high quality educational opportunities) . We hope this information can aid community leaders in remedying these deficiencies to assure reconstruction creates opportunity rich neighborhoods that are accessible to all people.